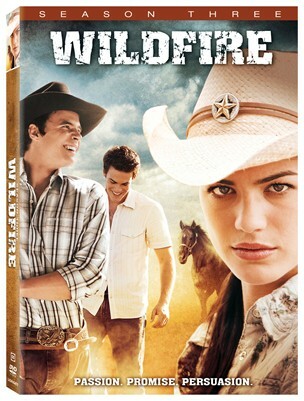 The third season of the acclaimed television drama “Wildfire” comes to DVD this March from Lionsgate. This imaginative series follows Kris, a young woman who finds excitement and romance at the horse ranch where she works. “Wildfire” posted the highest series premiere ratings in the history of ABC Family and was one of the network’s highest-rated original programs. The Wildfire: Season Three 4-disc DVD contains all 13 episodes of the third season, which originally aired in the spring of 2007, along with special features including episode commentaries. Kris Furillo (Genevieve Cortese, TV’s “Supernatural”) finished serving time at a juvenile detention center for grand theft auto and resisting arrest. Upon her release, she is offered a job at the Ritter’s family ranch after Pablo Betart (Greg Serano, Legally Blonde), a center volunteer who teaches inmates to ride horses, notices Kris’ unusual talent with the animals, especially the horse Wildfire, with whom she has bonded. In Season 3, Kris hopes to save Raintree Ranch from devastating financial news, but the rivalry between Raintree and Davis farms intensifies as they fight to save themselves. And a cruel betrayal leads Kris to reconsider her romantic relationship with Junior (Ryan Sypek, TV’s “Greek”). Meanwhile, Matt (Micah Alberti, TV’s “Smallville”) steps in and lends her his support leaving Kris once again torn. With two great guys to turn to she is forced to make a decision. Who will she choose?